Two new books by prominent gun-banners lay out the newest set of talking points for anti-gunners and the media to follow in their continuing attempt to rid us of our pesky Second Amendment rights. 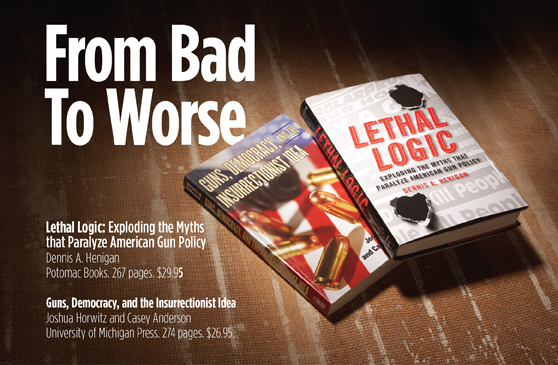 TWO OF THE TOP THINKERS at America’s largest gun-ban organizations have written new books, giving anti-gunners in the media plenty of new material to fawn over. 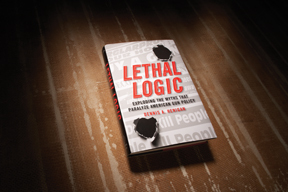 Dennis Henigan, the Brady Center’s chief lawyer, is the author of Lethal Logic: Exploding the Myths that Paralyze American Gun Policy. 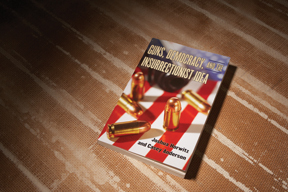 Josh Horwitz, executive director of the Coalition to Stop Gun Violence, and Casey Anderson, who is a former employee of the same group, have teamed up to produce Guns, Democracy, and the Insurrectionist Idea. As lovers of freedom, it’s important for us to understand the ideas promoted by the opposition in order to keep the truth in the forefront. Thus, while we typically don’t review anti-gun rights books, these new releases warrant our examination if for no other reason than to know what new lies, obfuscations and half-truths the press will soon be parroting. Each of Henigan’s seven chapters is an argument against a commonly-used slogan or idea of pro-Second Amendment advocates--“When guns are outlawed, only outlaws will have guns,” “An armed society is a polite society,” etc. Of all the people who work for gun control organizations, Henigan is probably the most influential thinker. It was he who cooked up the batch of 1998-99 lawsuits by anti-gun mayors and trial lawyers against firearm manufacturers, wholesalers, stores and trade associations. Ultimately, the suits failed to cripple the firearm industry, but they came close. Henigan is much more prescient than some of the other “intellectuals” at gun control organizations in recognizing when a particular position has become untenable and needs to be abandoned. Back in the early 1990s, when much of the anti-gun movement was still insisting that the Second Amendment protects a “collective” or a state’s right, Henigan apparently recognized that the individual right analysis was unbeatable. Consequently, in law review articles and other fora, he set out to construct the intellectual foundation for the “narrow” individual right--a microscopically tiny right of members of the select state militias, while in active service, not to be disarmed by the federal government. In Heller, it was Henigan’s “narrow” right theory that the four dissenting justices used in trying to deny the normal individual right that was affirmed by the majority opinion. In fact, the “collective” right pushed by Eric Holder and Janet Reno in an amicus (friend of the court) brief was dismissed by all nine justices as so obviously wrong as to barely merit discussion. In fact, the “collective” right pushed by Eric Holder and Janet Reno in an amicus (friend of the court) brief was dismissed by all nine justices as so obviously wrong as to barely merit discussion. So Lethal Logic, although not an official book of the Brady Campaign, presents what will likely be the key talking points for gun control advocates and their media allies in the coming months and years. More than half of Lethal Logic presents statistics and social science evidence that supports gun control. These pages show Henigan at his most reasonable in that he sometimes addresses counter-arguments or data that have been brought forward by gun control skeptics--particularly by Florida State University criminologist Gary Kleck. Henigan implicitly steps back from some untenable arguments that have long been popular with the gun control lobbies. For example, he does not assert that “guns are the most unregulated consumer product in America,” which has always been a patently ridiculous thing to say about the only consumer product that you have to get FBI or state permission to buy in a store. Instead, Henigan argues that it is proper for guns to be regulated much more heavily than other goods because they are inherently dangerous. The book would have been stronger if Henigan had been consistent in acknowledging and addressing counter evidence. For example, to support his assertion that defensive gun use (DGU) against burglars is rare, he cites the preeminent junk scientist of gun control, Arthur Kellermann. Kellermann reviewed 198 Atlanta police reports of burglaries, found that few of the police reports mentioned defensive gun use by the victim and announced that DGUs against home invasions were rare. However, the police forms did not include any field for the police officer to report gun use by the victim. Further, Atlanta police officers are not trained to solicit information about defensive gun use. Thus, the only time that a DGU would appear on the police report would be when an officer spontaneously decided to record it on the free-form section. In other words, Kellermann studied reports that were not designed to record DGUs, and on the basis of those reports he announced that DGUs are rare. The Centers for Disease Control--which will never be accused of being a “pro-gun” organization--conducted a national study of victim defense against burglary, and reported that there were over half a million DGUs against burglars annually. (Robert Ikeda, et al., “Estimating Intruder-Related Firearms Retrievals in U.S. Households, 1994,” 12 Violence and Victims 363 (1997).) Perhaps Henigan disputes the CDC study, but instead of discussing those arguments he shields the reader from its very existence and proclaims the faulty Kellermann study as truth. Similar points could be made about much, although not all, of Henigan’s social science discussion. His Second Amendment chapter is an angry denunciation of the Scalia majority in Heller, and a layman’s summary of the Brady Center’s failed legal argument in the case. In this portion of the book, when compared to the social science section, he is much less willing to address serious evidence on the other side. In a book written by a professional anti-gun advocate like Henigan, criticism of the National Rifle Association is to be expected. Yet he takes many cheap shots and draws numerous faulty conclusions. For example, the NRA denounced the Bureau of Alcohol, Tobacco and Firearms (BATF) in the Waco Branch Davidian case because, rather than serving its search warrant on the Waco compound by knocking on the door and demanding entry, BATF launched a “dynamic entry” on a building containing dozens of children. Henigan asserts that because the NRA criticized BATF’s tactics, “The NRA condones the murder of federal agents by persons suspected of violating federal gun laws.” Of course, that’s preposterous. Likewise, he blames the NRA for “deceiving” political pundits into believing that the NRA cost Al Gore five to seven swing states, and therefore the 2000 presidential election. Henigan fails to mention that even Bill Clinton later said that the NRA was the reason that Gore lost, and that Clinton elaborated on that argument in his book, My Life. Henigan also asserts that pro-gun rhetoric “is all about getting people to stop thinking”--as if Henigan’s allies do not, themselves, specialize in emotional appeals, no matter how irrelevant to the matter at hand. For example, this July the Brady Campaign’s Colorado affiliate was trying (unsuccessfully) to convince Colorado’s senators to vote against the Thune amendment, which would create national reciprocity for Right-to-Carry licenses. In this effort, the group bought full-page newspaper ads invoking the Columbine High School murders in 1999. Whatever else one may say about Columbine, it was certainly not the result of too many adults being licensed to carry handguns for lawful protection. Moreover, Henigan’s assertion that gun rights advocates are simpletons who parrot bumper sticker reasoning seems a bit hypocritical coming from a guy whose organization thinks that clever rhetoric consists of saying “God bless America” sarcastically. That’s the tag line of an old print advertising campaign from Henigan’s group, which listed the number of people whom “handguns killed” in several countries, including the United States. Notably, the ad does not say “criminals killed.” Henigan liked the line so much that he repeated it in the opening paragraph of the book. To Henigan’s credit, he does stay focused about 90 percent of the time in arguing against ideas that really are propounded by lots of mainstream gun rights advocates. The same cannot be said of Guns, Democracy, and the Insurrectionist Idea by Horwitz and Anderson. The Horwitz/Anderson thesis is that the National Rifle Association is an “insurrectionist” organization; that scholars such as Nelson Lund, Don Kates and myself--who generally agree with the NRA on many issues-- are “insurrectionists,” and that “insurrectionism” is a mortal threat to democracy. Truth is, the “insurrectionist idea” that Horwitz and Anderson purport to rebut is their very own invention, which they carefully concoct using libels, quarter-truths and invented facts. Not really. The “grenades and bazookas” quote comes from a 1996 Georgia Law Review article in which Lund argued that Second Amendment legal scholarship still had a long way to go. As an example, Lund contended that the theories of other Second Amendment scholars about why such weapons are outside the Second Amendment were not very well reasoned. Recently, Lund authored an amicus brief in District of Columbia v. Heller. That brief propounded Lund’s own theory of why weapons such as “fully automatic rifles” as well as “shoulder-fired rockets and grenades” can be regulated despite the Second Amendment. That brief was filed in February 2008, well over a year before the publication of the Horwitz and Anderson book. Given Horwitz’s own deep involvement in the Heller case as an amicus brief author, it is difficult to believe that he never read Lund’s brief. Thus, Horwitz and Anderson mislead readers with the false assertion that Lund believes that the government cannot regulate “grenades and bazookas.” In fact, Lund does believe they can be regulated, and simply argues with his fellow Second Amendment scholars about the best rationale for that conclusion. Just because you don’t want the government to keep lists of the books you check out from the library or the guns you own does not mean that you want an “insurrection.” Throughout history, guns have obviously been useful political tools for dissidents who were threatened by violence--such as the civil rights workers in the South in the 1960s who used guns to defend themselves from Ku Klux Klan attacks. Horowitz and Anderson supply absolutely no citation to support this bold claim about what Mr. Heston and I really “mean.” Indeed, I have never said nor written anything like the idea that Horowitz ascribes to me, nor did Mr. Heston ever say such a thing. The middle portion of the book argues against something that the NRA and many pro-Second Amendment writers actually believe: that the importance of an armed citizenry in defending civil liberty can be seen in the examples of the American Revolution, in the post-Civil War depredations of the Ku Klux Klan against the freedmen who had been disarmed, and in the Nazi genocide against the Jews, whom the Nazis had been careful to disarm. Yet when democracy itself is really endangered, the NRA is usually the group defending it. For example, the anti-gun lawsuits were carefully structured so that the dozens of cases could not be consolidated, and thus the lawsuits would exhaust the ability of handgun manufacturers to pay for defense attorneys--even if the plaintiffs could never win a single case on the merits. The expected gun-ban endgame was that, to avoid bankruptcy, the manufacturers would submit to a regulatory regime run by the anti-gun lobbies, although the same regulations had been repeatedly rejected by legislatures as well as by voters in ballot initiatives. In the end, democratically elected legislatures in most states banned the abusive lawsuits. Then the democratically elected Congress of the United States of America enacted a national ban, and the democratically elected president of the United States signed it. All of this was done in accordance with poll after poll that showed a very large majority of U.S. citizens opposed the junk lawsuits. It’s hard to believe that anyone will ever outdo Horwitz and Anderson in dredging Internet comment boards for “insurrectionist” quotes to use in their book. Yet one quote is oddly omitted. It cannot be that Horowitz and Anderson missed it, because the quote is used repeatedly in many of the articles they cite. It’s the quote that gives the lie to the Horwitz/Anderson pretense that everyone who believes that resistance to tyranny is an inalienable right must also believe that “Government is the enemy.” The quote comes from the great man who, from the 1940s to the 1970s, personified big-government liberalism. His heartfelt faith in the positive power of a large and active federal government was at its best in his tireless, relentless, triumphant work for federal civil rights legislation to banish Jim Crow forever. No. Hubert Humphrey was simply a patriot who revered our Constitution, who walked forthrightly in the bright sunshine of human rights, who loved democracy and the rule of law, and who wanted our government to be the best in the world. As do all of us who believe in the principles of the National Rifle Association of America.